The research aircraft begins a rocket-powered flight after being launched from the mothership's wing. In this historical photo from the U.S. space agency, the X-24A lifting-body research aircraft begins its rocket-powered flight after being launched from the wing of NASA's B-52 mothership during a 1970 research flight. NASA B-52, Tail Number 008, is an air launch carrier aircraft, "mothership," as well as a research aircraft platform that has been used on a variety of research projects. The aircraft, a "B" model built in 1952 and first flown on June 11, 1955, is the oldest B-52 in flying status and has been used on some of the most significant research projects in aerospace history. Some of the significant projects supported by B-52 008 include the X-15, the lifting bodies, HiMAT (highly maneuverable aircraft technology), Pegasus, validation of parachute systems developed for the space shuttle program (solid-rocket-booster recovery system and the orbiter drag chute system), and the X-38. 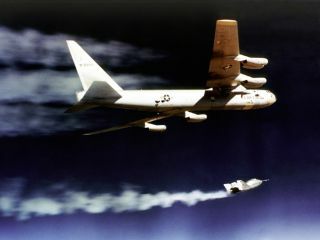 The B-52 served as the launch vehicle on 106 X-15 flights and flew a total of 159 captive-carry and launch missions in support of that program from June 1959 to October 1968. Between 1966 and 1975, the B-52 served as the launch aircraft for 127 of the 144 wingless lifting body flights. In the 1970s and 1980s the B-52 was the launch aircraft for several aircraft at what is now the Dryden Flight Research Center, to study spin-stall, high-angle-of attack and maneuvering characteristics. It also supported eight orbiter (space shuttle) drag chute tests in 1990. In addition, the B-52 served as the air launch platform for the first six Pegasus space boosters. During its many years of service, the B-52 has undergone several modifications. The first major modification was made by North American Aviation (now part of Boeing) in support of the X-15 program. This involved creating a launch-panel-operator station for monitoring the status of the test vehicle being carried, cutting a large notch in the right inboard wing flap to accommodate the vertical tail of the X-15 aircraft, and installing a wing pylon that enables the B-52 to carry research vehicles and test articles to be air-launched/dropped. Located on the right wing, between the inboard engine pylon and the fuselage, this wing pylon was subjected to extensive testing prior to its use. For each test vehicle the B-52 carried, minor changes were made to the launch-panel operator's station. Built originally by the Boeing Company, the NASA B-52 is powered by eight Pratt & Whitney J57-19 turbojet engines, each of which produce 12,000 pounds of thrust. The aircraft's normal launch speed has been Mach 0.8 (about 530 miles per hour) and its normal drop altitude has been 40,000 to 45,000 feet. It is 156 feet long and has a wing span of 185 feet. The heaviest load it has carried was the No. 2 X-15 aircraft at 53,100 pounds.